Most award show viewers have a love-hate relationship with the mani-cam; we detest the fact that a Giuliana Ranic-approved manicure-spotlighting camera is something that exists, but when it seemed like it wasn't going to be a part of the Golden Globe red carpet pre-show, we found ourselves majorly disappointed. One person who doesn't have such a mixed view of the mani-cam? Top of the Lake star (and later, Golden Globe winner) Elisabeth Moss, whose thoughts about the device came across very, very clearly. Giuliana was less than pleased. In true Jennifer Lawrence fashion, the actress snuck up on Taylor Swift, made a weird angry face, and proceeded to crash the singer's interview with Ryan Seacrest. And the Internet was happy. The photobomb wasn't the only part of the actress' Globes experience to go viral. Her dress was copied by everyone from a cat to a mermaid to a fellow celebrity, Arrow's Colton Haynes. And a thousand Gifs were born. Maybe "kiss" isn't the right word. More like "violently grabs his face and smothers him with her mouth." Slurring her lines, holding her drink, and throwing off her shoes mid-presenting? And we thought we couldn't love Emma Thompson any more. 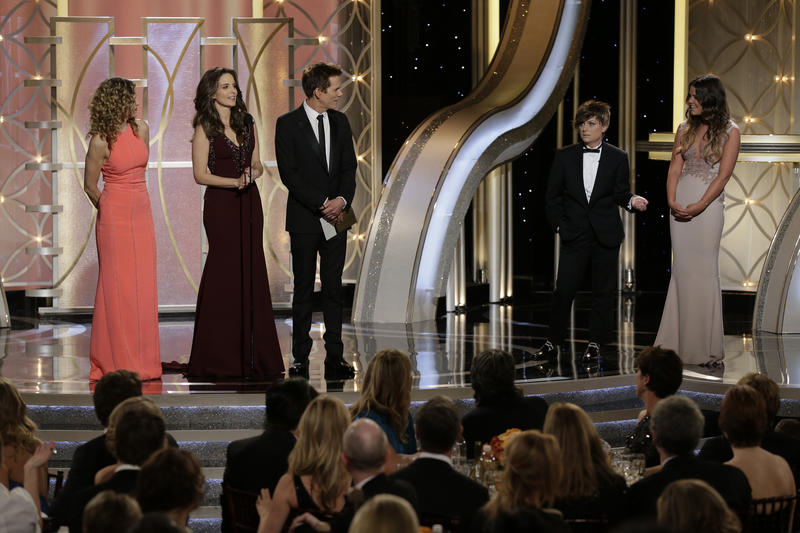 Upstaging Sosie Bacon's Miss Golden Globe was Mr. Golden Globe, the moody, shaggy-haired son of Tina Fey. The boy went around asking celebrities if they were his dad, seeing as his mom refused to tell him. Some choices were likelier than others. Super awkward normally. Even more awkward on live TV. Because it gave us this, one last time.